CDE systems ...produce high quality sand. According to a report by Frost & Sullivan, in 2020 the GCC would be generating up to 120 million tonnes of waste per year, up from the current 94 million tonnes – a substantial volume of which is CD&E waste. In line with the region’s focus on recycling in order to lead the way to a greener and more profitable future for the construction industry, the Northern Ireland-headquartered CDE offers wet processing plants dedicated to the recycling of CD&E waste. Due to the highly variable nature of this waste, each plant that CDE designs is built according to the specific requirements of the project. Managing waste water and clay/silt is one of the key challenges for this type of system, he adds. “When a CDE AquaCycle high-rate thickener with integrated polyelectrolyte dosing station is added to the wet processing plant, fine contaminants rapidly settle to form a dense sludge which can be pumped away to a remote settling area. Clean water then overflows the thickener to an adjacent water storage tank after being filtered to remove any residual floating contaminants. From here, water can be readily recirculated to the washing system,” Garg explains. Aggregates and clay-bound particles pass directly from the rinsing screen to the CDE Rotomax logwasher, which is equipped with twin shafts fitted with chromomolybdenum blades. Highly attritioned material is then discharged from the front of this unit to a dewatering screen below. This recovers liberated fines and water, which are then passed back to the rinsing screen via a ground sump and pump, encouraging initial fluidisation of the feed material whilst reducing the fresh water requirement. Light contaminants including organic elements such as wood and grass are actively floated off from the rear of the specialist log washer. This is then passed to a trash removal screen, which recovers water and fine particles to the sand washing unit. The dewatered aggregates are then conveyed to a dry screen for final size classification. The system can produce up to five washed products simultaneously. Garg says the wet processing of construction, demolition and excavation waste materials can add much greater value and open up new markets for the products than more conventional dry screening processes. It also releases additional products including commercial sand. In addition, using the latest washing technologies means that water availability and waste fines management is no longer a significant barrier to efficiently processing even the most difficult materials. Garg says most operators still rely on dry crushing and screening to recycle C&D waste. “This method only produces low-value aggregates with limited applications and does not allow for the recovery of -5 mm material, representing 20 to 25 per cent of incoming waste, which ends up in landfills. “With CDE wet processing solutions, operators can produce high-value sands and aggregates with gradings adapted to a large range of applications, and enjoy the added bonus of recovering and transforming -5mm material into a saleable product. 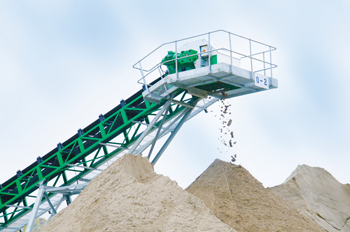 “The CDE recycling technology allows operators to increase their production of high-quality sand and aggregates by recovering and treating materials that are no longer waste but saleable products, preventing the diversion to landfill of up to 90 per cent of incoming waste,” he explains. In countries where the preservation of the environment is vital and at the core of a well-thought strategy for industry growth, CDE’s high-tech solutions for construction, demolition and excavation waste recycling are perfectly adapted to quarries and construction companies wishing to diversify their offering whilst making a fast return on investment, he concludes. CDE, which is celebrating its 25th anniversary in 2017, has been developing CD&E wet processing waste recycling solutions across the world for 12 years. Each plant is co-created with the customer for an exact fit both in terms of footprint and also in terms of product quantity and quality requirements. For instance, CDE installed the largest bespoke CD&E waste recycling solution in the world in Norway in 2014 for quarry company Velde Pukk. Processing 300 tonnes per hour of CD&E materials diverted from landfills, the company recycles 600,000 tonnes of waste per year, thanks to CDE’s wet processing technology.